I bought this on a whim, and absolutely love it. Makes removing soothing cleaning milk easy and seems to help exfoliate a bit. Dries quickly. Soft on my skin , easy to clean and just simple and pretty. I’ve tried others although this one is super! Large. I highly recommend purchasing one or several. It cleans away dirt with a smooth flow over the face and neck. I place it in a delicate washer bag and add to my white clothes wash. I’m giving these as gifts to my favorite friends. An oblong, flat sponge made from cellulose, it gently exfoliates and deep cleanses. I use it at night, every other day, and it makes my skin feel very soft and clean. Best addition to the accessory line! Love this as it is very helpful in removing makeup. .....never used a sponge for cleansing...always either a face clothe or just my hands. The Cosmetic Sponge is perfect for washing my face, especially when using the Soothing Cleansing milk. It is soft, but I can tell that it is working to remove my makeup. My skin feels cleaner when I use this than a washcloth. So far it is holding up to daily use, and I like that it's machine washable. The price for this is great for what you get! I love this sponge! It is perfect for removing makeup and feels great on my skin. I really like using this on my face. It is much more gentle than a washcloth and dries quickly after cleansing. 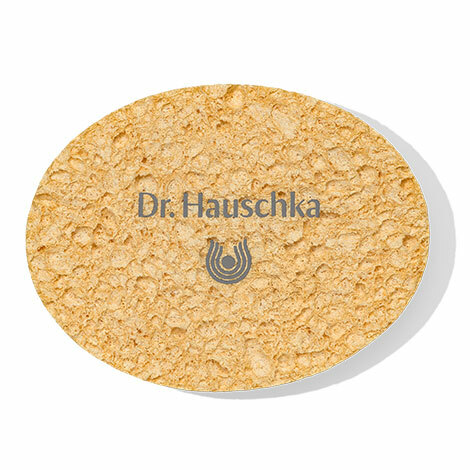 I love these sponges; they are great for removing the Dr. Hauschka masks. Looks like a piece of cardboard till wet and is seriously a great tool to use with your cleansers. I use this on the days when my Clarisonic is too much or my skin needs a gentle touch. Very effective at getting your face clean. Great product for sensitive skin. Wow! This little sponge is great! Perfect for taking off my make up at night and easy removal of excess Cleansing Cream...I admit, when I opened it up and saw this thin, oval, dry flat object I laughed...seriously? Completly worth the $ for me as it makes night cleansing that much easier. This is a mild exfoliator and I love using it along with the cleansing milk which is my favorite Dr. Hauschka product! This sponge is a perfect size it not soft but it exfoliate and leaves your face soft and feeling great. It would great if make a bigger one for the body. This is a great sponge - it is very gentle yet removes make-up and cleanser really well. It has replaced using a washcloth and my face feels really good after using it. Easy to wash and dry out between uses. I used to use soft washcloths to wash my face until I found this sponge. It is softer than the softest washcloths I've found, and I let it dry completely between washings so that it does not promote bacteria growth. Washing it really well after us and allowing it to totally dry is the key to keeping it fresh. I really like the sponge to stuff off dead dry skin. My face always gels so good when I use it- usually a couple of times a week after a mask treatment. I love this little sponge. Wish it came in a pack of three or so. Feels soft, gentle exfoliation. I use it remove the cream cleanser and it helps my skin feel smooth and clean. I have been using the Mia face brush for several years. I got the Cosmetic Sponge as a gift in one of my orders. I haven't used my brush since! I love this sponge to remove my makeup. My face feels very clean and I know it is not too rough on my skin. I haven't been able to find these sponges anywhere else. Thank you!